The Big History Project course is a great one. As good as it is, it pales in comparison to what teachers do with it. They tweak the activities. They write new ones. They swap out readings and videos. They overlay their approaches to reading and writing. They share and debate these changes with their peers. They do a million little things to make the course more effective for their students. We know that great professional development is not about a day or two training before the school year starts. Great professional development is about finding space for teachers to really take a hard look at their own practice, to learn from other teachers (and scholars), and to help others—wherever they might be—on their own paths. When the first set of lessons was created three years ago, we worked with a group of experienced, effective teachers to document how they were teaching BHP in their classrooms. Ever since, we’ve asked BHP teachers to treat every lesson as a first draft. We collect feedback on what is working, what isn’t, and get teachers’ thoughts about how we can make things better. Then, we incorporate this feedback into our annual update. We try to edit about 10 percent of the course each year. This means that the Big History Project gets better each and every year. We’re proud of these updates. Still, we believe that the thought that goes into that BHP teacher feedback is far, far more valuable than anything we do. In thinking about, discussing, and debating their own practices with peers from the BHP community, teachers learn more than in any workshop. 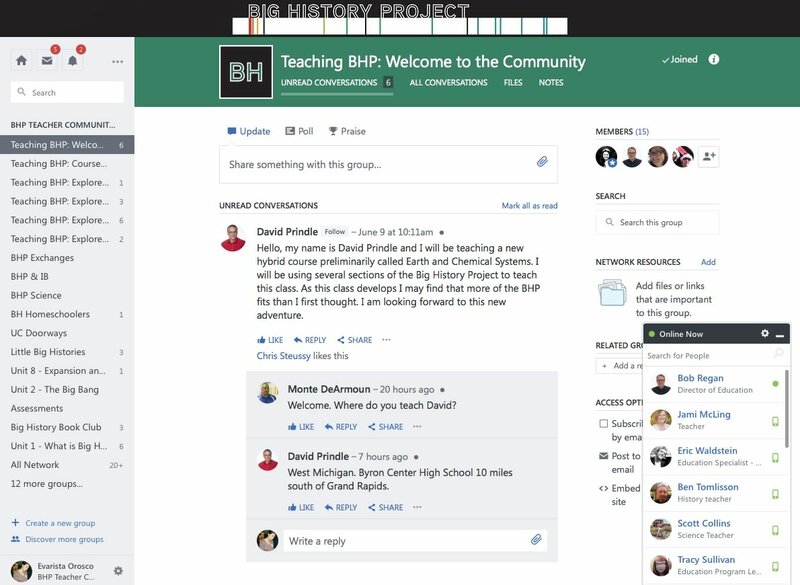 The bulk of the discussions among teachers take place online in the BHP Teacher Community. As you might on Facebook, teachers post into a feed that builds over time. There are discussion areas dedicated to new teachers, individual units of the course, and a variety of other subjects. We hold moderated discussions called “BHP Exchanges,” where we invite scholars and experts to answer questions about issues important to teachers. We also make sure there are a group of teacher leaders identified so there are always knowledgeable people available to answer questions online. There are loads of high-quality teacher communities. We’ve learned a ton from many of them. However, there are very few that focus specifically on a single curriculum like ours. As a result, the discussions can be a little distant from the topics a teacher really wants to discuss. It’s a simple idea, to build a formal PLC by focusing a community on a particular curriculum, but it is surprisingly rare. Our teachers tell us that these conversations between peers are incredibly valuable. In addition to the BHP Teacher Community, the Big History Project also has a larger network across Facebook and Twitter. Our posts and tweets are less of a conversation, more of a way to share insights from teachers, lessons from the course, and discuss relevant news topics. 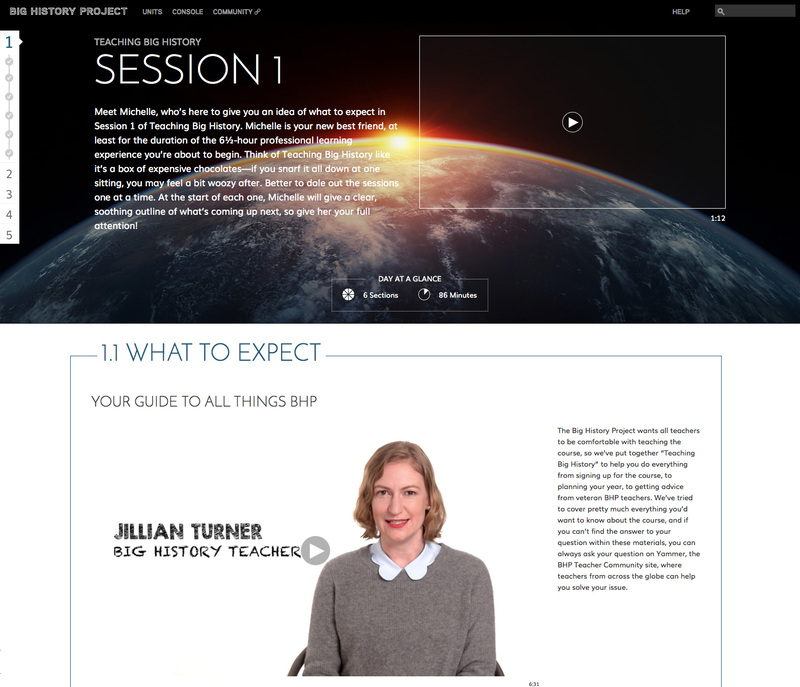 For teachers new and newish to the Big History Project, it’s helpful to have an in-depth introduction to the course, the lessons, and the community. Our new training course, Teaching Big History, provides teachers with a comprehensive overview. Designed in partnership with BHP teachers and the University of Michigan, Teaching Big History delivers about 9 hours of training. It covers each of the eight thresholds of BHP using selected videos and articles from the course itself. It reviews the key instructional practices from the course so that teachers can choose what to adopt into their own practice. It covers the core logistical elements of the BHP program, explaining how to set up a class, enroll students, and access key resources. Finally, the course will introduce teachers to the BHP Teacher Community, inviting them to comment on units and discuss the process of planning their school year. There are times when all else fails and you just want to get in touch with us directly. If you ever have a question, you can always reach us at help@bighistoryproject.com.